The League: Season Four Coming to FX! Its that time of year, the air is crisp, the seats have been realigned in living rooms to get optimal viewing of a 92” inch flat screen because baby it is football season! Of course what would football season be without the FX comedy THE LEAGUE. The show premiered on FX in 2009 and audiences caught on quickly. The premise is quite simple, in the middle of Chicago there is a fantasy football league. Six friends that include Pete (Mark Duplass), Stephen Rannazzisi as Kevin, Knick Kroll as Rodney, Paul Scheer as Dr. Andrew, Jon Lajoie as Taco and Katie Aselton as Jenny team up as viewers get a peek inside their twisted lives. Filled with guest stars that include the likes of Terry Bradshaw, Antonio Gates, Chad Johnson, Josh Cribbs, Terrell Suggs, Brent Grimes, Sidney Rice, Matthew Berry and Matt Forte it is a feast for sports fans. 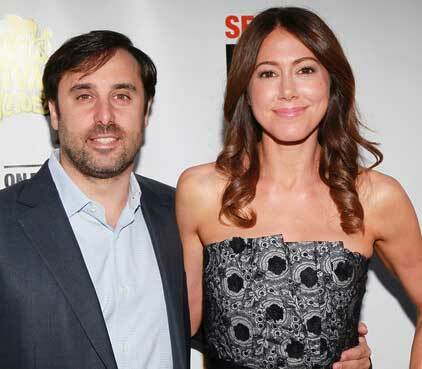 The show itself is the creation of husband and wife team Jeff, who also directs, and Jackie Marcus Schaffer. These folks must be doing something right as fans go nuts at the premier show and get cranky when the season comes to an end. It was great to talk to the shows creators about what’s coming up, working with an awesome cast and their new addition to the family. Thanks for chatting today! You have such a huge fan base as I saw this year at Comic Con. How do you guys keep coming up with this great material? Is it easy, tough or how do you do it? Jeff: The best thing is at the end of every year we’re like totally spent. We’ve used sort of all of our ideas, and then you take a little break from the show and you go out in the world and people are generally terrible, and that’s how you get new ideas. And a lot of the stuff in the show gets taken from our own lives. For instance, this season “Kevin” and “Jenny” have a new baby, and Jackie and I also have a new baby so we’re sort of just pulling directly from our lives. So you consider it a normal life or just a funny one? Jeff: Yeah. It’s complicated. I think we’re hoping that we’re not as crazy parents as “Kevin” and “Jenny,” no, but it’s been wild. Look, sometimes the fact that Jackie and I work together and live together and have a family together does—they all sort of complicate each other. I think last season we were out to a restaurant. We were working on stories and just talking and Jackie started to have a drink of water and was sort of choking and I was sort of saying, “Are you okay? Are you okay?” But as I was doing that there were TV screens and ESPN was on and my eyes darted from her choking to the TV and she goes, “Were you watching TV while I was choking?” And I said, “No. No way. I was not.” I swore up and down that I wasn’t but I’m thinking to myself that’s a funny idea so we put it down on our idea list, and later (I didn’t think anything of it then) she’s looking through the idea list and she goes, “‘Kevin’ looked at the TV when ‘Jenny’s’ choking. You did! You did!” I didn’t realize I had totally ratted myself out by putting it on the big list of ideas. How did you guys handle the replacement refs this year for the storyline? Jeff: Well, you know the—talking about the asterisk? Jackie: Yeah. I mean we—you know everybody’s been talking about how the Seahawks win with basically a win with an asterisk, but the reality of it is that we already had our own asterisk stories as you will come to see with ‘Kevin’ who won the Shiva Bowl last year, and he’s got to prove to everyone that he deserves to actually be considered a Shiva Bowl Champion because he won under pretty false pretenses by cheating against ‘Ruxin.’ For the season they are going to be calling ‘Kevin “Kevin McAsterisks”’ and we had already sort of coined that term for ‘Kevin’ before they ever did for the Seattle Seahawks record. You seem to work so well together, what is it you admire about one another? Jeff: Jackie is the best. First of all she’s the best producer I’ve ever, ever, ever worked with. She is amazingly resourceful because this show is made for not a lot of money. It’s basically the independent movie version of a TV show, and there’s nothing that she can’t do. I mean she was in labor and dealing with RG3, Trent Richardson, the … brothers, Ryan Fitzpatrick, and Desean Jackson. The opening scene of the show, that NFL draft, we shot on July 10th because all those players were in town for the …. we were supposed to have a baby July 27th but she went in to labor July 9th so you don’t know commitment until you’ve seen someone going through contractions and dealing with prepping a shoot. It is incredible. Jackie: Am I supposed to respond to that? That’s like the nicest compliment ever. Jeff: You could say something like Jeff’s okay. Your silence is damning! Jackie: Oh, no. I didn’t know it was my turn to speak. You know what the thing is that I think one of the things that make our show so great is how fresh the comedy is, and to have the comedy stay fresh you have to push the envelope. And while some people might be surprised that some of the naughtier things that are written in the show are written by me, some of the most clever, outside the box ideas that people and our fans have fallen in love with like the turn of the phrase—my husband is the guy who wrote re-gifting on Seinfeld. He has a brilliant, brilliant way of going about writing on The League and so many of the phrases that people love come from his brilliant comedic mind, and so I think it’s the fact that he always pushes the envelope just a little bit further. And I go, “I don’t know if people are going to get this. This might frighten people. This might make people question our morality.” And he says, “No. No. No. It’s good. It’s good. As long as it’s funny we should try it. We should try it.” And he’s always right, and always original and that’s what I think makes our show feel like it’s got real fresh comedy that people don’t feel like there’s a retread. Your doing both Fantasy Football and character storylines, how do you manage that? Jeff: I think every show we try and—we always start with 20 stories. That’s how we write each episode, you know, what’s a funny thing for ‘Kevin’ to do? What’s a good ‘Pete’ story? What’s a good ‘Ruxin’ story? And we always start with just good straight comedy stories, but then we always try—I think the good episodes also mix in some of the fantasy aspect because that’s what these guys really care about, and it’s their obsession. Their obsession about this little thing but treating it like it’s a big thing is the heart of the show. Are there any limits to what you will or will not talk about? Jackie: No. I mean we don’t have any limits. Thank God FX has a couple so they may … better, but by the way, they don’t have many. I mean I saw one of the episodes of Sunny last night at our Sunny/League premiere, and wow they got away with some stuff that I didn’t even know we’d be allowed to get away with. There’s this lovely woman named Darlene Tipton who runs standards and practices for FX, and she literally has the hardest job of anybody I’ve ever seen. Are Jenny and Kevin going to use the baby strategically on their fantasy team? Jackie: Episode Two! And by the way, it’s not right what they’re doing. What they are doing and what they are playing for, it’s not right to do. I mean that sort of limit, that part of a child was not meant to be played for sports. Jeff: Right and the other thing, you know, there are a lot of NFL players who want to be on the show, and the challenge for us is writing them in a believable way. But one of the nice things that’s happened this year with ‘Kevin’ and ‘Jenny’ having a baby and them living in Chicago is that Kristin Cavallari and Jay Cutler, the quarterback for the Chicago Bears, have also just had a child. And in the fourth show of the season the Cutler baby or as we call him the “Cutlet” is going to feature very prominently. And so they’re using that kid. That kid had basically one free day on this earth before being used as a pawn. Did you get the pro players that you wanted this season or are there still some you are trying to get, or even actors for that matter? Jackie: We haven’t like sort of—oh, there are definitely players that we’ve been chasing after and there is one in particular that you’ll see later in the season in the season finale that is a guy that we’ve wanted on since the very beginning. And he is now a fan of the show and he’s going to come and he’s going to show up in a very special surprising way so we’re looking forward to that. I mean I just have to say one of the guys I’d love to see on the show that’s friends of all of our guys—I’ll just say it. I don’t know if it’s politically correct to just go out and say—like to just be trolling for guest stars on a blogger call. I mean it’s kind of pathetic frankly, but Aziz Ansari makes me laugh my … off. He’s friends with basically every single person who works on our show or who has ever worked on our show, and he’s the guy I’d like to work with. Is it difficult to get who you want? Jackie: The athletes are easy. Yeah, the athletes are all fans. It was amazing last night at the premiere party we were with Rich Eisen and Jack … and those guys were just texting some of the athletes who are on our show and some other guys. Actually, in the middle of the premiere party Barry Sanders started tweeting at us, “Why didn’t you guys invite me?” And for Jeff and I who are giant football fans—I mean we love the sport so much—to be in the middle of a great night like The League/Sunny premiere and be getting Tweets from Barry Sanders saying, “Why aren’t I there? It looks fun” as we were live Tweeting the premiere was one of the coolest things I’ve ever experienced. Have you had to turn down some players? Jackie: Only because we have no space. I mean there are a lot of players who want to do the show that we’re talking to who we’d like to have on the show, but frankly you have to write a believable story. I mean these guys don’t work in the NFL. Jeff: Right. It’s not our list. These are five schmoos in Chicago so we always try to make sure that when they’re in the NFL players are in for a good reason, but there’s a long list of first round fantasy football picks who want to be on the show and we’d love to have them. We just have to figure out how. You said some of the stories are autobiographical in a way, is that true of Taco’s story? Jackie: I know. Please when you see this season premiere they’re not autobiographical. I was a woman who was pregnant when I was writing the show, but please people, when you see the season premiere all the things that ‘Jenny’ does as a pregnant woman are not the things that Jackie Schaffer did as a pregnant woman. I imagine that some things would be funny to see as a pregnant woman. I did not actually do them all myself. I must say that now. Jeff: The fun thing is each of the actors is so great and has such a distinctive voice that there’s never any question when we’re writing. It’s like, “Oh, is this a ‘Taco’ story or a ‘Ruxin’ story?” Like is this an ‘Andre’ story? You know, and it’s the same when we’re shooting on the set. It’s like these guys are so brilliant, and they have such a great grasp of their character and how their character fits into the group dynamic that we generate so much fun material just on the way they interact with each other in between some of the lines that are in the outline. I mean Paul Scheer is amazing. It’s such an amazing skill that he can do which is…—he gets insulted. He defends himself in a way that just gives them so much more … to insult him, and he knows how to do that better than anybody I’ve ever seen in my life. He’s amazing. Jackie, you had your first baby, congratulations! Jackie: Yes. Thank you. It’s very exciting. Healthy baby girl and we joke about all of the things that we have been writing as TV parents on The League. I mean God help us that our daughter grows up like ‘Ellie.’ I mean that child is a train wreck and so I mean it’s like her and ‘Ruxin’—‘Ruxin’ saying, “Don’t be a …” and her saying, “I don’t want to be a …” I mean we wrote all of that thinking it was funny and now the reality has set in that could possibly happen with our child and it’s terrifying. Jackie: ‘Pete’s’ grandfather, which we’re very excited. We just shot this last week and ‘Pete’s’ grandfather is played by Robert Wagner, and he is awesome. Ken Marino came by and he was terrific, and also Ryan Hanson from Party Down. Jeff: J.B. Smoove from Curb Your Enthusiasm came and was hilarious as the most vain man you’ve ever met in a wheelchair. He just knocked it out of the park. Jackie: And don’t forget Tim Olyphant who plays the white sushi chef in episode three. He’s fantastic. Jeff: Oh, yeah. I keep doing that. Yes, ‘Frank “The Body” Gibiatti’ is back too, very, very funny, and yes we’ve got—and uh, Jeff Goldblum. Jackie: Yeah, we’re working on his schedule right now. Jeff: To get ‘Rupert Ruxin’—‘Ruxin’s’ dad back also. It’s been a very, very fun year. It’s been a crazy season. We’re very happy with it. How are you managing to balance parenthood and the show? Jackie: It’s impossible. It’s madness. Our child is like one step away from honey boo-boo. The kid is in a trailer for so long with so many days I bring her to work. I mean she’s a tiny baby but you know what we feel like…it’s all good. When she looks back at her baby book she’ll see that she had her own media pass with her name on it to Dallas Cowboy’s Training Camp, and what little girl can say, “I’ve been to Dallas Cowboy Training Camp three times in the first basically month of my existence”? When it took Jeff practically almost four decades so there you go. How ever this power couple is managing they seem to do it not only extremely well but also with a great sense of humor! The series premier of THE LEAGUE happens Thursday night at 10:30 pm on FX!